Francisco Garcia did what a lead-off hitter has to do in this July 1990 contest for short-season Eugene. Garcia got on base with a single. He then stole second to get himself into scoring position. And then he scored on another single to give his team an early 1-0 lead, according to The Spokane Chronicle. Garcia served as Eugene's lead-off hitter in his second year as a pro. He wouldn't get a chance to lead off a game, or hit anywhere else, again. Garcia played just two seasons as a pro. 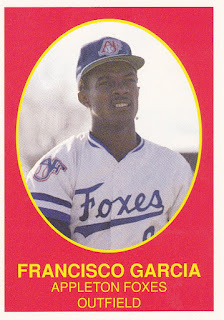 Garcia's career began in 1989, signed by the Cardinals as an undrafted free agent out of his native Dominican Republic. Garcia played his first season in the rookie Arizona League. In 50 games for the rookie Cardinals, Garcia hit .322, with 23 RBIs and 14 stolen bases. For 1990, Garcia moved to the Royals system. He played at three levels, in the rookie Gulf Coast League, single-A Appleton and short-season Eugene. At Eugene, Garcia got into 53 games, hitting just .238. He went 2 for 4 in an early July game, then 2 for 3 in a late-July game. Also by late July, Garcia had shown "flashes of brilliance, offensively and defensively," The Eugene Register-Guard wrote. But those flashes weren't enough. His second professional season was his last as a pro.